Since the Sri Yantra is such an important sacred geometry one wonders if it relates in any way to the human physiology. 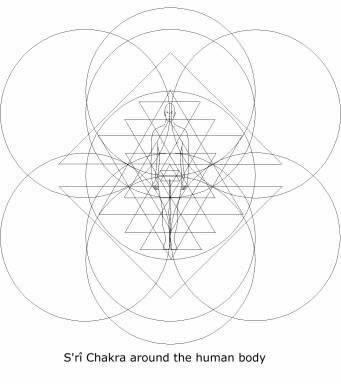 After doing some research on the web we have found two different sources that mention a field around the body that is similar to the Sri Yantra. 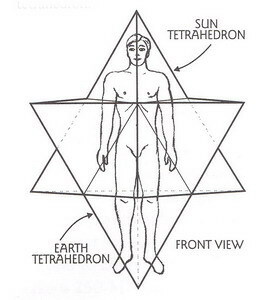 Drunvalo Melchizedek in his work on the flower of life geometry has mentionned that there is a field of energy around the body in the shape of a star tetrahedron. 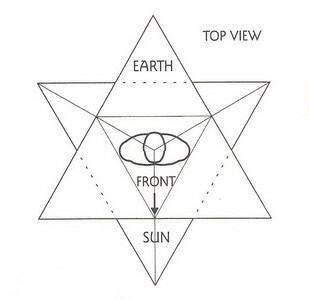 It is called a Merkaba which translates as vehicle of light. Drunvalo's teachings on the Flower of Life are excellent. He has unfolded a whole system of knowledge that is worth looking into. A must if you are interested in sacred geometry. He also teaches a breathing technique that allows one to enliven these fields by rotating them. Drunvalo goes on to say that these fields exists around every living thing. 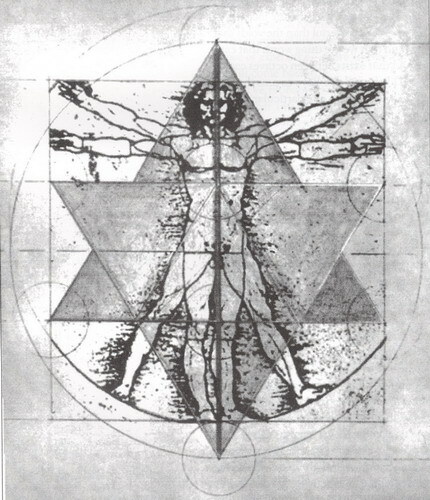 More information on the Merkabah can be found here. For information on the Flower of Life geometry go here. The most fundamental archetype of our universe is the S'rî Chakra. S'rî means supreme and Chakra means circular structure. The S'rî Chakra exists as a three-dimensional construct within which all evolving beings exist. It serves as a superstructure upon which the 432,000 devas responsible for the functioning of the body perch, like birds on a tree. One of the most important functions of the S'rî Chakra is to act as a communications device -- much like an antennae -- that connects the individual mind with the Mind of the Creator, Lord Brahma. You can read more one the website here.